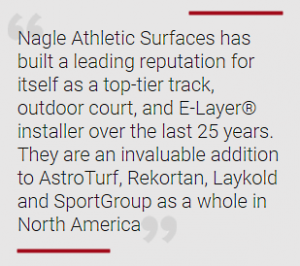 AstroTurf Corporation is pleased to announce the acquisition of Nagle Athletic Surfaces, Inc., a prominent track and outdoor court installation specialist based in East Syracuse, NY. Nagle joins the SportGroup family of companies, which includes AstroTurf, Advanced Polymer Technologies, Polytan, SYNLawn, Melos, and more. The sale was finalized on July 31, 2018. The Nagle acquisition marks a significant investment in the Rekortan and Laykold brands a commitment to the track and outdoor court industry. Designed for the modern elite athlete, Rekortan is a diverse, world class series of polyurethane running tracks that is unmatched in quality and performance. As SportGroup’s flagship running track brand, Rekortan has helped SportGroup earn more Class 1 and Class 2 IAAF certifications than any competitor across the globe. Paul Nagle of Nagle Athletic Surfaces stated, “Nagle is excited to join SportGroup and to offer the Rekortan brand. Since the 1960s Rekortan has been known as the surface of choice for elite competitions around the globe. Our clients will benefit from cutting edge chemistry, pure raw materials, and exceptional installation quality.” Paul Nagle will continue as CEO of Nagle Athletic Surfaces and operations will remain in East Syracuse, NY. AstroTurf and Nagle will leverage turf and track synergies to provide high performance athletic surfaces throughout the Northeastern United States. For athletes and sport enthusiasts, AstroTurf® has redefined the way the game is played. Now powered by SportGroup, the brand offers advanced, state-of-the-art, multi-sport and specialized synthetic turf and running track systems with proprietary engineered technologies. A growing number of high schools, colleges, professional sports teams and municipalities continue to select AstroTurf-branded products for their premium quality, technical superiority, and safety. To learn more, visit AstroTurf’s website at http://www.astroturf.com. As a premier installer of athletic surfaces with over 100 years of combined management experience, including two inhouse ASBA-Certified Track Builders, institutions across the northeast trust and rely on Nagle as a valued partner. Visit Nagle’s website at http://www.nagleathletic.com to learn more. Taking a Shortcut Can Actually Take Longer and Cost More…Much More!